For parents who appreciate classic style or sleek modern designs, there is nothing quite like a wooden bassinet to perfectly accent your décor and provide a safe, sturdy first bed for your newborn. And, with well-constructed wooden bassinets being such a popular family heirloom that is passed down through the generations, purchasing a wooden bassinet is an opportunity to begin a family tradition. 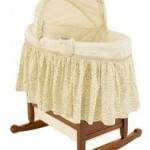 When shopping for a well-made wooden bassinet, there are a few things to look for to ensure proper construction. When purchasing a wooden bassinet from a reputable retailer, new parents should feel relatively secure that there will be no defects or safety concerns; however, the following tips will help you ensure that your wooden bassinet will suit your needs and meet your safety standards. 1) Check for a sturdy, well-constructed base that is stable and secure. 2) Look for wooden bassinets with wide, well-balanced bases to lower the risk of tipping over if there are pets or other children in the house. 3) Make sure there is no hardware sticking out that could scratch you or your newborn. 4) Run your hands over the surface to make sure it is smooth and splinter-free. 5) If you or your baby has chemical sensitivities, you may want to consider looking for wooden bassinets with natural finishes. Wooden bassinets are available in a wide variety of styles and stains that is sure to include a piece that is perfect for your décor and style. Whether you prefer dark walnut hues, or the classic look of maple, wooden bassinets are a timeless addition to any home’s décor and provide a sturdy, well-made infant bed to ensure your newborn sleeps safely and soundly. When purchasing a wooden bassinet for your own newborn or for expectant parents, take into consideration the style of the room in which the wooden bassinet will reside, as well as the color of any other wood in the room or in the home. Modern decorating practices no longer dictate that every piece of wooden furniture must have matching wood and stain; however, a light oak wooden bassinet may not be the most fashionable choice for a home filled with rich mahogany. Well-made wooden bassinets are more than just a safe, convenient first bed for your newborn. A wooden bassinet is a statement of style and shows that you appreciate quality and construction that can be enjoyed for generations. Wooden bassinets are quintessential heirloom furniture pieces that provide a safe, stylish bed for each new addition to your family, with sturdy construction that allows them to be passed down to continue the tradition and welcome your children’s children home. It is a rare opportunity to find a sentimental, heirloom-quality item that your baby will have from birth and then will use with her own baby years from now. Purchasing a wooden bassinet is an ideal opportunity to create a family tradition that will carry on for generations. This entry was posted on Tuesday, April 14th, 2009 at 9:07 pm	and is filed under Bassinet Guides. You can follow any responses to this entry through the RSS 2.0 feed. You can leave a response, or trackback from your own site.